iOS is arguably the most sophisticated, seasoned mobile operating system available today. Love it or hate it, we are currently running the ninth version iOS–and there are no signs of slowing down any time soon. Apple has approached updates to iOS with the “slow and steady” mindset. There has never been a silver bullet update to end all updates, and I’m ok with that–mostly. It’s hard to be patient, especially when there are whispers each year of purported upgrades, and new features planned for iOS. One thing we can count on, though–Apple won’t release/introduce a new feature unless it’s ready for primetime. This can be frustrating at times, especially when we crave the next big thing. However, in the end, the user experience is king regardless of any features added to the latest version of iOS. Over the years, one of the biggest enigmas with iOS has been the stale, unchanging home screen layout. The first screen we see when we power on our iPad’s and iPhone’s, is in need of major upgrade. The current layout has become boring and outdated. It’s true that many new iOS users may find comfort in knowing that a quick press of the home button will always bring them to the same screen _every_ time. But does this mean that this screen has to remain a boring grid of icons–even after 9 iterations of the OS? I say no, and it has never been more clear than after the introduction of the iPad Pro. I’ve been trying out a few different iOS 9 enabled workflows on my iPad, and one of the ideas I stumbled upon was maintaining an always-on Split View app. The choice of this app would is very important, of course. One of the major advantages of working on the iPad has long been the one–app–at–a–time approach. The iPad is supposed to just become whatever musical keyboard, game, or writing machine you want it to be…and the rest is supposed to fade away. That effect is reduced by the presence of a Split View app on my Air 2, and that case is especially evident if the Split View app is dynamic in nature. Let’s take a bit of a break from criticizing iOS 9 and shine a light on one aspect that has been working really well so far: Spotlight Search for third-party apps. I honestly had my doubts about this one when it was announced. It’s an exciting prospect and could prove to be a new, extremely powerful way to navigate your information, regardless of the app. That’s because it’s often easier to remember a piece of information (“pie recipe”) rather than which app you’ve placed that information in. Swiping between different home screen pages and opening app folders can very quickly become disorienting, and I’ve often found myself entering apps only to ask: what was I looking for again? 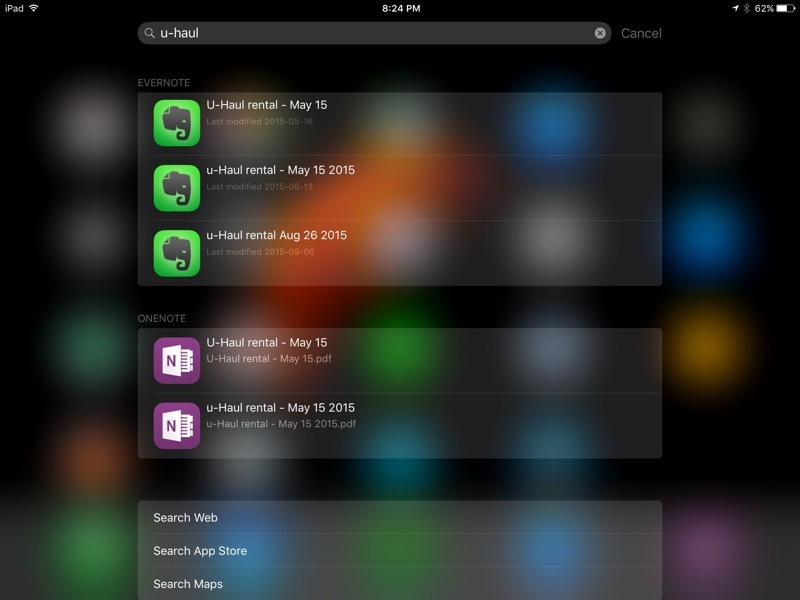 Spotlight search for third-party apps addresses this issue by letting you type into the search bar and find relevant results, organized by app. 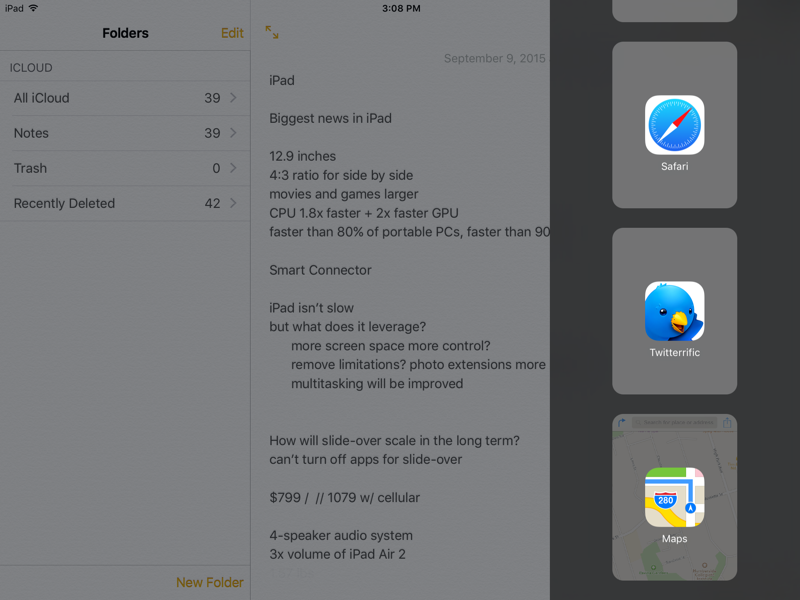 Slide Over loads an app in a compact, iPhone-like view over your current app; they are not loaded simultaneously. Think of Slide Over like dragging a smaller piece of paper over a larger one. 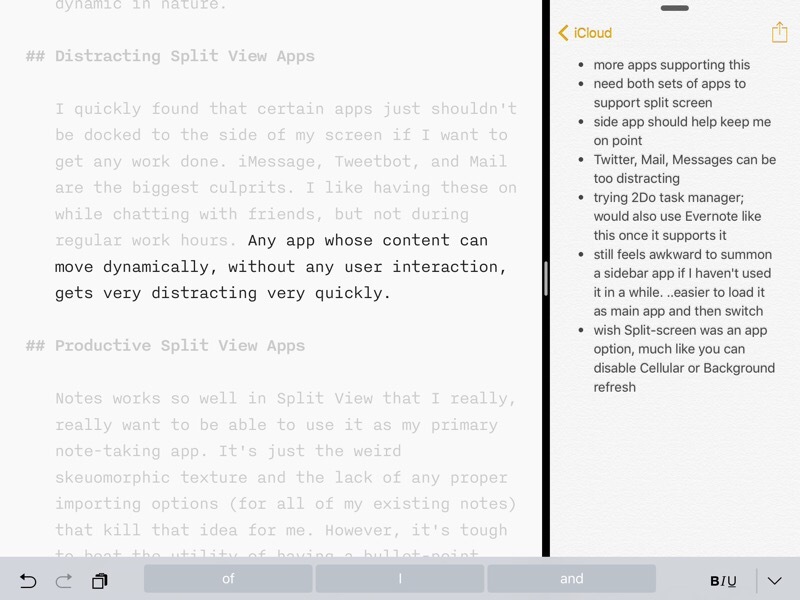 Split View is true multitasking, but only on iPad Air 2 and iPad Pro. You can run two apps side by side, with one app taking the majority of the space, or two apps sharing the screen equally. It took me a little while to remember to use these multitasking features, especially since banners and the ‘back’ button already aid in a lot of my multitasking needs. However, there’s no question that revealing an iMessage conversation with one swipe is a very powerful feature. I tend to use Slide Over more than Split View — but that’s probably because only a handful of my daily apps have received iOS 9 updates. I’m still waiting on Evernote, Paper, 2Do, and others. However, one thing that I’ve wondered about this interface is how well it will scale. It was easy to use during the iOS 9 beta because only Apple’s own apps would show up in the Slide View bar. In other words, there really weren’t that many to choose from, and there were only so many useful combinations. Notes and Safari, Photos and iMessage, or Reminders and iMessage were really the only apps I would to run side by side. However, expanding that selection to include third-party apps changes a lot, and the UI for selecting Slide Over apps doesn’t scale — it just becomes a longer list. This isn’t too bad if I’ve just been switching between a few apps for Slide Over, but what about the times I’d like to use Reminders and Safari…but Reminders is a good 10–20 apps up the list? The unfortunate answer is: a lot of scrolling. I have over 33 apps that are compatible with Slide Over, and they aren’t sorted in alphabetical order. I think a one-colum interface is the wrong way to go about tackling this issue. 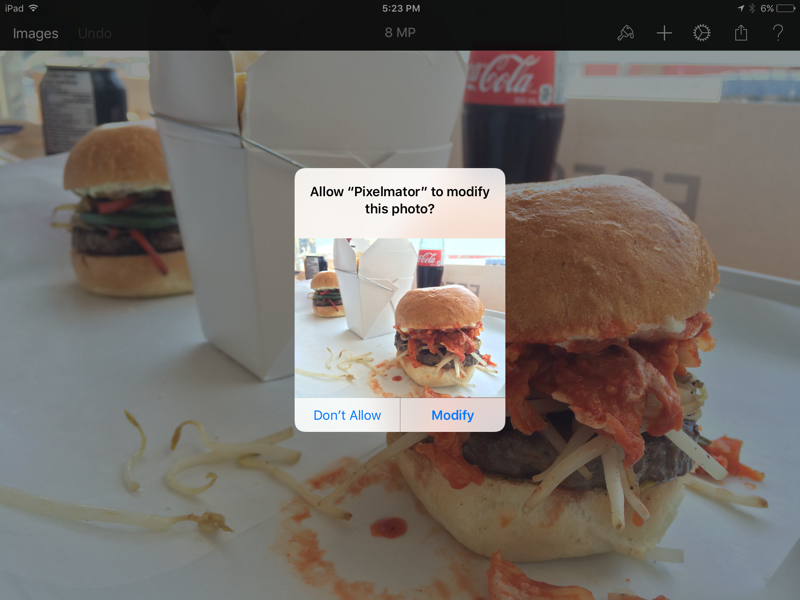 As such, I think this will be one of the first UI changes that Apple makes to iOS 9. I think the interface should remain very simple: no search function or folders should be necessary. Simply displaying two or three columns instead of icons would do a lot more for users than showing just one. Apple would have to balance this system out to make sure it doesn’t look too visually cluttered, but if the icons were small enough, I think it could work. Anyone have suggestions for how to improve this situation, or is this just a UI nuance we’ll get used to quickly?